The Daily Lew – Issue 3 | Watts Up With That? LewWorld is a busy place these days. Claims of conspiracy theory are supplemented with even more claims of conspiracy theory when some obvious flaws to data and methodology are pointed out, like faked responses. Faked responses abound in the Lewandowsky “moon landing” paper because there were not any adequate quality controls. Further compromising the data integrity, yesterday Steve McIntyre discovered that Lewandowsky’s assistant, Charles Hanich offered the survey to staff and faculty at UWA, but there’s no mention of this in the peer reviewed paper, and no record of whether those results were excluded or not. There’s no mention of surveying academic peers. Thus we don’t know if the survey data was polluted by peers at UWA who are/are not climate blog users. Following standard recommendations (Gosling, Vazire, Srivastava, & John, 2004), duplicate responses from any IP number were eliminated (N = 71). I am sorry for not replying earlier. You have raised a very valid point. We are aware of methodological issues, one of which is dealing with repeated replies. a) Use the provision offered by the hosting company to block repeated replies using IP addresses. This, however, will block legitimate use of the same computer, such as in our laboratory, where numerous participants use the same PCs. b) Not to block multiple replies and allow for the possibility of repeated replies when evaluating the data. We chose option b), which was more practical in our situation. I took the liberty of attaching an paper by Whitehead (2007) [SM – see here], addressing some of these issues. What their method does is remove repeat respondents attempting to vote stuff the survey with identical responses, but it does nothing to exclude participation within your own organization (UWA) where departments might run network proxy portals to reduce bandwidth or to increase network IP availability. These typically present a single IP address. Lucia discussed the IP issue, and the lack of quality control methodology here. Without knowing how many respondents came from blogs, and how may came from UWA peers, it pretty much makes this survey and paper useless. Add it to the growing pile of fatal flaws that have been ignored in order to paint climate skeptics as “nutters”. Removing the outliers (which removes the most grotesque fake responses, but not all of them), Lewandowsky’s signature conspiracies (MLK, Moon, MLK) – all of which have negligible adherence – are now disproportionally held by warmists. The problem is (as demonstrated by the multiple taunting missives of the last week from him) Lewandowsky simply doesn’t care about errors, the vote stuffing by pals he invited, or how he’s seen by others. In his mind, since he has already attracted worldwide press attention before the paper has even been published, it’s a case of “mission accomplished” for him. Even if the paper is retracted or rejected by the journal, it will still be used as a tool to bash climate sceptics, much like the now long debunked 97% of climate scientists myth. Marc Morano sees it as a case of desperation. Given the lack of journalistic curiosity these days, I doubt that much in the way of retraction/rejection of the paper in scientific circles will reach the public, but the myth of “skeptics believe the moon landing was faked” will live on even though it has no basis in reality or data. Our best defense is to vociferously complain and point out the multiple fatal flaws any time we see Lewandowsky cited. The sad part is that Dr. Stephan Lewandowsky has demonstrated himself to be a psychological propagandist, and he’s accomplished what he set out to do, and fake data doesn’t matter to him. It is clearly another case of noble cause corruption where the end justified the means. The classic conspiracy theory: Big Oil pays for anti-global warming propaganda. And worse, to avoid a scandal, his University will ignore the accusations or paint all over this with whitewash. What is the danger? Well, John Cook is meddling with free speech. And Lewandowsky is attempting to marginalize those who speak freely. That can be pretty dangerous, in any social setting, but especially when it becomes government policy. Who is funding these two fellows, (and their cohorts, if there are any?) Is it the government, in any way, shape or form? If so, you ought be annoyed, if not alarmed, because it is your tax dollars that are going into meddling with your free speech. Calling Muir Russell. Whitewash needed. Ha ha a ha …Looks like the Lew – Crew is hitting the “Rate This “? Am not sure I was able to explain John Cook via Twitter last night that, if he manages all those servers for many people fighting AGW, then there is no accusation of conspiracy if somebody points out that simple truth. Dr Lewdicrousky, Professor of disanalogy and fallacious comparisons. If the University do nothing they are complicit in propagandist pseudo-science. Yet they will still do nothing allowing their reputation to decline. The “paper” should be used as an example of how not to do it. Reminds me of a Thursday night grad school course some years back. The Prof came in one night and passed out a survey to all seven of us students. Five minutes later we were all done and the regular class went ahead as scheduled. Six months later the Prof published a paper . . . “Recent research indicates that . . . Seven grad students . . . such a fair and representative sample of the population at large. Option 3 would be to trash-can the whole thing. Very impressive work by the skeptical blog authors – Watts, McIntyre, Lucia, Nova, Pielke, Fuller, Motl, and others. I’m thinking Lewandowsky and Hanich are kicking themselves for not asking for your advice before building this ball of snow and kicking it down the hill. Some kind of coincidence that Katharine Hayhoe is spouting similar nonsense. UNDENIABLE FACT OF LIFE: Kooks that are most likely to believe in Roswell UFO’s or faked moon landings or 9/11 as an inside job by Cheney and the Jews are the same leftist scum that peddle AGW. No IQ required to become a liberal, leftist, democratic socialist. It is obvious Cook-Lewandowsky set up their survey to distract the public from the scientific issues the so called “skeptics” are attempting to make known to the general public. Cook and Lewandowsky have a clear agenda. Cook and Lewandowsky obviously sent their “cooked“ study to extreme warming fanatics who supplied the “cooked“ answers. The questions asked do you think men walked on the moon or do you think only a single gun man killed President Kennedy or do you think AIDS is caused by HIV were answered by the extreme AGW fanatics poising as “skeptics” to discredit the so called “skeptics”. This driver for this embarrassing propaganda effort, is the science does not support the extreme warming paradigm so the extreme AGW supporters use a desperate ad hominem attack on the so called skeptics to hide the fact that the observations and analysis does not support the extreme AGW position. I do not excuse the “ethical” communities that absolve those responsible from this type of obvious shenanigans. The extreme warming supporters create a strawman with incorrect statements and then address the strawman, rather than the observations and analysis that indicates the extreme AGW predictions are incorrect as the planet’s response to a change in forcing is to increase planetary clouds in the tropics. It is interesting that the same type of shenanigans are carried through in the IPCC reports. Shortly after Dr. Trenberth requested that I draft the Atlantic hurricane section for the AR4’s Observations chapter, Dr. Trenberth participated in a press conference organized by scientists at Harvard on the topic “Experts to warn global warming likely to continue spurring more outbreaks of intense hurricane activity” along with other media interviews on the topic. The result of this media interaction was widespread coverage that directly connected the very busy 2004 Atlantic hurricane season as being caused by anthropogenic greenhouse gas warming occurring today. Listening to and reading transcripts of this press conference and media interviews, it is apparent that Dr. Trenberth was being accurately quoted and summarized in such statements and was not being misrepresented in the media. These media sessions have potential to result in a widespread perception that global warming has made recent hurricane activity much more severe. I found it a bit perplexing that the participants in the Harvard press conference had come to the conclusion that global warming was impacting hurricane activity today. To my knowledge, none of the participants in that press conference had performed any research on hurricane variability, nor were they reporting on any new work in the field. All previous and current research in the area of hurricane variability has shown no reliable, long-term trend up in the frequency or intensity of tropical cyclones, either in the Atlantic or any other basin. The IPCC assessments in 1995 and 2001 also concluded that there was no global warming signal found in the hurricane record. The science does not support extreme AGW. The planet is not warming in accordance with the IPCC predictions. The IPCC extreme AGW warming, general circulation models amplify CO2 warming (positive feedback). Analysis of top of the atmosphere radiation from satellite vs ocean surface temperature indicates the planet resists warming or cooling changes (negative feedback) by increasing or decreasing cloud cover in the tropics. The extreme warming IPCC predictions of 1.5C to 5C warming for a doubling of CO2 require that the planet amplifies the CO2 warming which is positive feedback. If the planet’s feedback response to a change in force is negative a doubling of atmospheric CO2 will result in less than 1C warming with most of the warming occurring at high latitude regions of the planet which will cause the biosphere to expand. There is no extreme AGW warming problem to solve. We estimate climate sensitivity from observations, using the deseasonalized fluctuations in sea surface temperatures (SSTs) and the concurrent fluctuations in the top-of-atmosphere (TOA) outgoing radiation from the ERBE (1985-1999) and CERES (2000-2008) satellite instruments. … ….We argue that feedbacks are largely concentrated in the tropics, and the tropical feedbacks can be adjusted to account for their impact on the globe as a whole. Indeed, we show that including all CERES data (not just from the tropics) leads to results similar to what are obtained for the tropics alone – though with more noise. We again find that the outgoing radiation resulting from SST fluctuations exceeds the zerofeedback response thus implying negative feedback. In contrast to this, the calculated TOA outgoing radiation fluxes from 11 atmospheric models forced by the observed SST are less than the zerofeedback response, consistent with the positive feedbacks that characterize these models. The results imply that the models are exaggerating climate sensitivity…. However, warming from a doubling of CO2 would only be about 1C (based on simple calculations where the radiation altitude and the Planck temperature depend on wavelength in accordance with the attenuation coefficients of wellmixed CO2 molecules; a doubling of any concentration in ppmv produces the same warming because of the logarithmic dependence of CO2’s absorption on the amount of CO2) (IPCC, 2007)…. This modest warming is much less than current climate models suggest for a doubling of CO2. Models predict warming of from 1.5C to 5C and even more for a doubling of CO2. Model predictions depend on the ‘feedback’ within models from the more important greenhouse substances, water vapor and clouds. Within all current climate models, water vapor increases with increasing temperature so as to further inhibit infrared cooling. Clouds also change so that their visible reflectivity decreases, causing increased solar absorption and warming of the earth…. This, clearly, is the difference between “climate science” and “science deniers.” Those who adhere to “climate science” wisely realize that defining a set of real-world parameters or observations by which we can test and potentially falsify a global warming theory is irrelevant and so nineteenth century. Modern climate science has gloriously progressed far beyond such irrelevant annoyances as the Scientific Method. 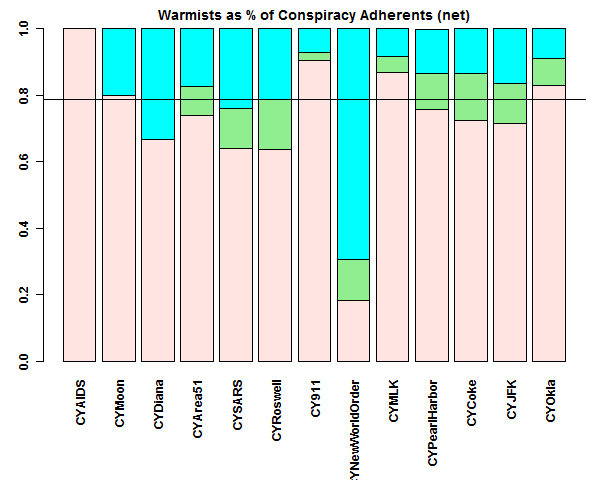 So to sum up – the paper shows more warmists believe in conspiracy theories than skeptics. How about a survey to see how many warmists and skeptics believe in Creationism as the true factual origin of our Earth? IMHO, I think warmists are more likely to believe this way as the “science” they are already doing is so science deficient. “The survey carries no risks for participants” — such as accidentally upholding institutionalised insanity? This reminds me of the risks people face when their speeches are captured by the Russian state TV: the advice is to keep your mouth shut once you spot a camera aimed at you. A few hundred video frames showing lip motion can be mixed with an arbitrary soundtrack; combine that with anti-free speech laws and there’s a great personal risk. A thought came to me similar to Einstein’s response that you only need one person to prove you wrong. So what if one or two or even a majority of people that believe a certain theory are “nuts”? Does that make the theory any more or less correct? A lot of people believe in gravity and they also believe in Bigfoot, alien abduction, etc. Does that mean gravity does not exist? Of course not. I’m sure a lot of “nuts” believe in AGW as well. But what does that mean? Personally I don’t see what the fuss is about. All online surveys are garbage. Yes, all of them. I wonder what Uri Simonsohn will say? Lewandowsky and others who invent smears for The Cause want MSM coverage; they don’t give a iot for what is written in the blogs. Where can we order the Lewandosky toilet paper with his face on it? Should I just use the Lew issue of Nature Magazine? Incompetence or dishonesty, so many questions. I was going to say you can’t make this stuff up – but apparently you can. What’s even worse, Lewandowsky has received over $11million in grants for his ‘research’ (or to propagate his deluded propaganda). Skeptics could have told him more warmists are nutters for free. When the Oz economy implodes in the next 12 months I can’t see Lewlew keeping all his grants intact. And you wouldn’t want the ethics comity at UWA anywhere near your daughter. I’m sure that was not an easy decision but fwiw I think it was a good one. Your expertise in the climate debate will be better spent outside of the IPCC; they have an agenda other than scientific truth. Stick to the Lew, my darlin’…………. He has out done Gleick, and that takes a lot of effort. I just peeped at Lew’s website and get this…apparently our ‘interest’ in his shenanigans is in fact ‘proof’ that we are all indeed, loopy. “The public response to my forthcoming paper in Psychological Science, entitled “NASA faked the moon landing—Therefore (Climate) Science is a Hoax: An Anatomy of the Motivated Rejection of Science,” has provided a perfect real-life illustration of the very cognitive processes at the center of my research. I have already made this point for you a couple of times in comments to this series of articles, without the irony. There are undoubtedly weird people out there, and there is no obvious reason that they should be excluded from your survey. They may well make up (say) 1 or 2% of the population. Your survey is designed to find them, first by asking weird questions to which only they will give a positive answer, and secondly by excluding the “don’t know” option, thus excluding anyone who doesn’t have total knowledge of Rosewell, the Oklahoma bombing, etc, and isn’t prepared to lie. You have designed an anonymous, easily gamed survey in which normal sceptical human beings cannot participate without lying. And you have managed to demonstrate, based on 2, 3 or 5% of your sample, that people who believe that the government is lying to them about one thing will also tend to believe that they are lying about another thing. To the Lew: Physician, heal thyself. I honestly feel insulted by the lack of effort and thought put into this hoax; do they really think we are that stupid, that we would see through their fraudulent survey almost instantly? Wow – I just went over for a peep at shapingtomorrowsworld. It is a Not Very Brave Lew World from what I read, more a Nutty Lew World. In the psychobabble vernacular it uses it might be the entitled the Deconstructed Post Normal Lew World. All posters here should have a good look at the Youtube performances of Professor Lew. You want psycological insight ? A couple of short videos is worth a shitload of comments. Moonwalker and Award-Winning NASA Astronaut/Geologist Jack Schmitt – who recently declared he was a global warming skeptic and now, Award-Winning NASA Astronaut and Moonwalker Dr. Buzz Aldrin. Need I quote more? The paper should be thrown in the bin. An utter embarrassment. Neil Armstrong waled on the moon. The moon landing was not staged. Princess Diana died in a tragic car accident and was not executed. I am utterly sceptical, in fact dismissive of people who say otherwise without providing hard evidence as opposed to speculative conspiracy theories. CAGW is the biggest scam ever perpetrated on the human race. Someone once wrote a book that said Osama Bin Laden died many years ago. Then we read that Osama Bin Laden was killed after he died. Methinks that the surveys done by Prof. MünchhausenLewandowsky are were more to provide decoration to his ideology, than to serve either purpose of a lamp-post; illumination for the sober or support for the intoxicated. As it turns out; the lamp-post serves another purpose, to produce a car-crash. Which is what happens when you don’t watch where you’re driving. I must ask again. What possible excuse does the journal have for this and why has the paper not been retracted by now? There is no reason to be surprised. Lewandowsky knew exactly what he was doing. He was following the same path as CAGW climatology where the advocates are the new breed of pachyderms employing and selling the post normal science BS. Most “normal” (in Lew’s eye’s abnormal) scientists would likely see the degeneration of science into “post normal” science as just a reversion to pre Galileo science. Does anyone really believe that academics were bereft of logic prior to Galileo. They practised this “post normal” science – just different techniques, devils and advocacy. Welcome to the new dark ages of science – the Lew world order. In his world the adage “there are lies, damn lies and statistics” is not allowed to be quoted – I was snipped on his site for this. Hard to counter pachyderms with science as public climatology is now just politics with its accompanying nonsense. Just keep hammering them when the scientific method is not being followed. As an Aussie I would like to know why up to $12 million has gone to Lew for “scientific” research. Out of curiosity, I ran a tally last night on US trade with Israel. Did you know that in 2011 US companies sold about $13,698,534,636 in products to Israeli customers? Thats up from $11,198,505,398 of 2010. The state with the highest percentage of Muslim population, New York, did $5,149,863,894. California, #2, did $2,682,469,132. Well that takes care of the warmist mantra of “get your denier paper peer reviewed and published” doesn’t it. “What a tangled web we weave when first we practice to deceive” . At the above post, Jo Nova reports that Lewandowsky gets $1.7 million in public funds to produce this kind of stuff. We see the logo and motto of the University of Western Australia. The motto is: “Achieving International Excelence”. Nova wonders what value the Australian tax payer gets from this investment. It’s a good question. Lewandowsky’s work seems specifically designed to help his university achieve international derision. I have to agree with Marc Morano. They are no longer even debating the issue, but just taking ad hominems to a new level. I suspect they are doing so because they have lost the scientific debate, and now just have to discredit the opposition. Having said that, I must mention that there are quite a few academics at UWA (and other universities) who are humbled by awareness of their lack of wisdom. They, like the refugees, adopt the motto as a perpetual imperative. How very true Carl. This was however missing in the survey’s conspiracy list, wonder if Lew himself believes in it. Jeff ID, at this point, I think Lewandowsky needs to release the survey data that he supposedly collected for his survey including a list of the sites where the data were collected. I’m suspicious at this point as to whether a survey was even done. It’s possible the paper is entirely fraudulent.